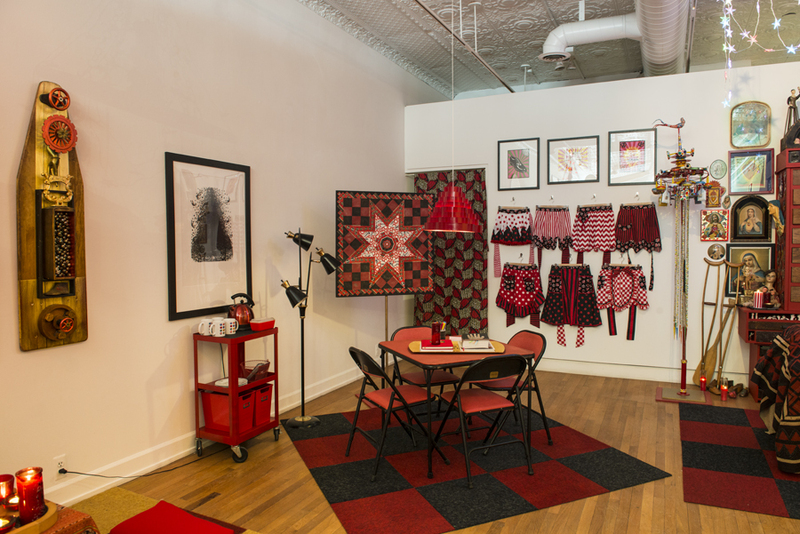 The images in this gallery are of the installation for my show, “Shaman Johnny’s Pop-Up Shop & Gallery”, at Work Gallery in Ann Arbor, Michigan from March 11-April 2, 2014. 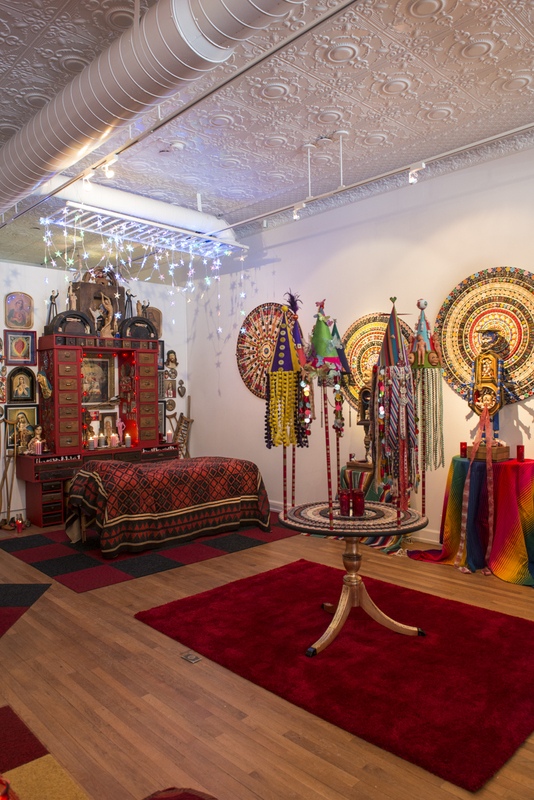 The installation was an exploration and visualization of queer theory, queer space, queer identity, and liminality using the queer archetype of the shaman as a fulcrum for the piece. 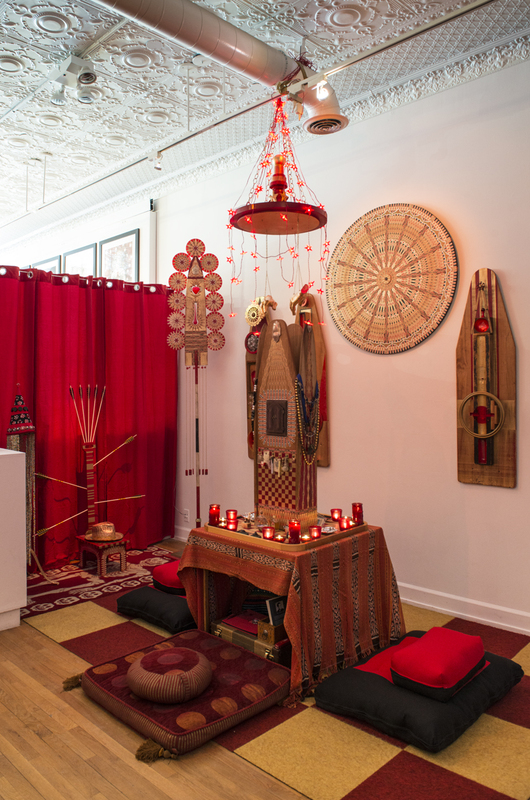 It consists of a front gallery and shop that represents a pre-liminal space, a sacred backroom space that functions as a liminal space, and a photo booth that operates as a post-liminal space. 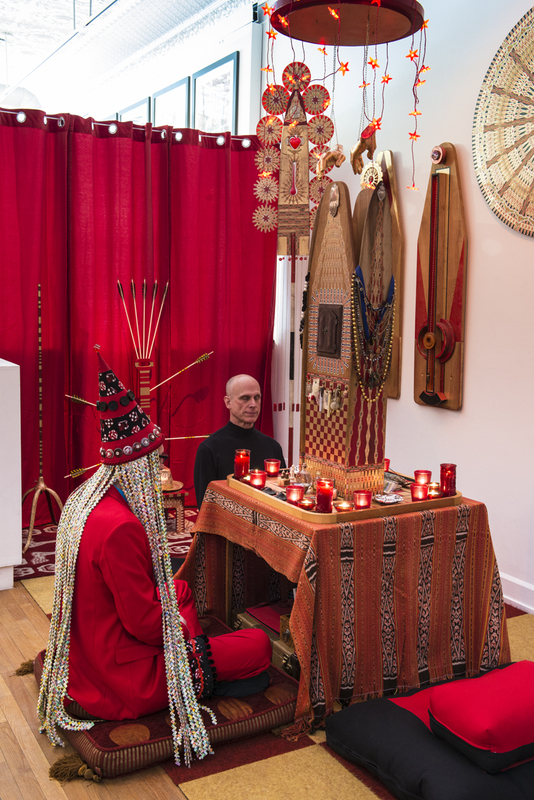 I was in the gallery every day dressed as my queer persona, Shaman Johnny, where I met with visitors in the sacred backroom and offered meditation, divination, or therapeutic bodywork as a means to enter into a queer or liminal state. 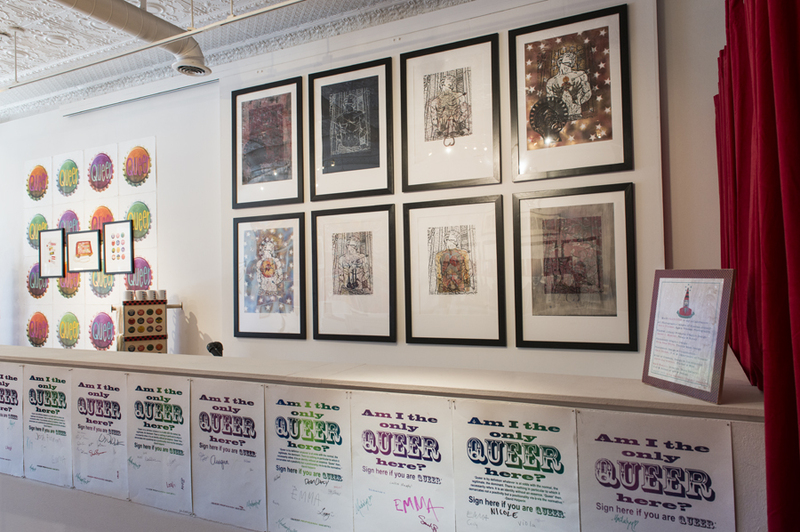 The show was set up to facilitate conversations with visitors about queerness and queer identity and how it is manifested in the 21st century. I focus on the concept of “queering” and how to translate this visually and linguistically to the creation of objects, people, and place using my own personal gay history as a reference point. I look at at what it means to “queer” objects through curation and display using my private collections as examples. I present my attempts to apply the concepts of queer theory to my studio practice using print media, gay valentines, the self portrait, and old scholastic photos of myself as another way of creating a gay personal visual history. I look at language through queer slang and the effect of being taunted for being perceived as queer and as a way of going back and marking myself and my childhood as queer. I employ images of St. Sebastian to visualize the concepts of shame and abjection. I look at queer space through Arnold Van Gennep and Victor Turner’s work on liminality, and explore queer personae through the lens of shamanism and the creation of my queer or alternative persona, Shaman Johnny. 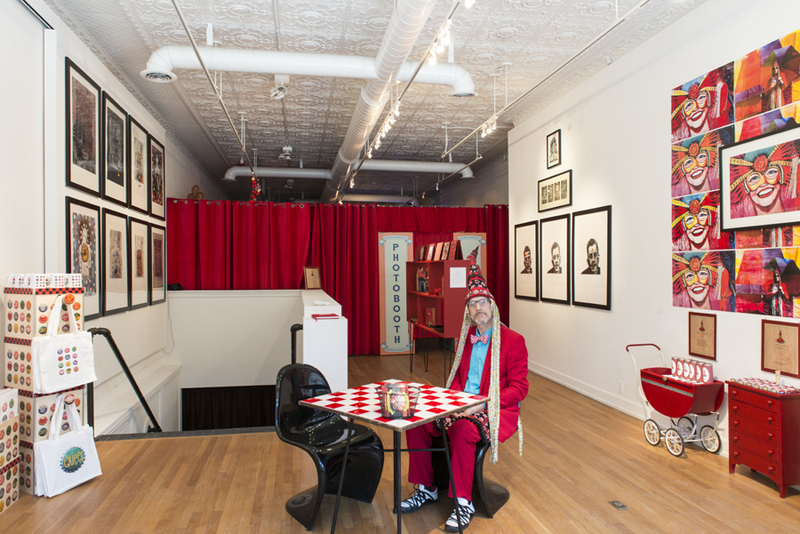 Shaman Johnny sitting in the front space of Shaman Johnny's Pop-Up Shop & Gallery. 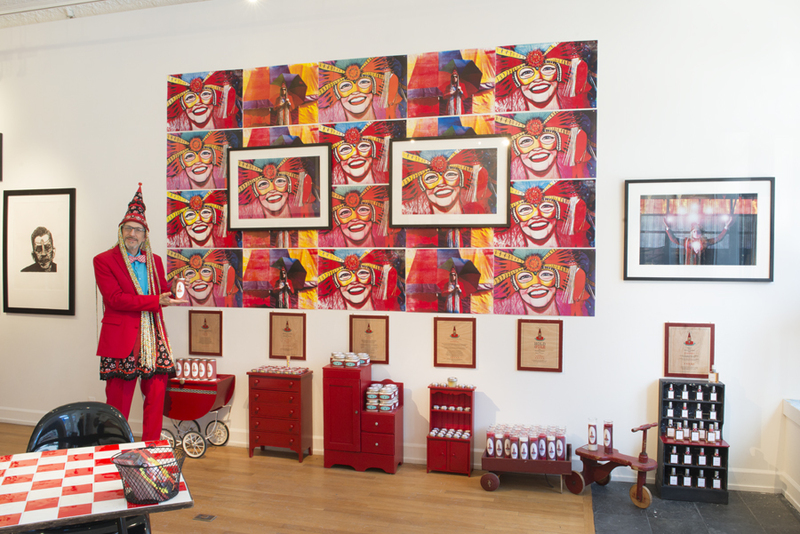 Self portraits, Shaman Johnny prints, and Shaman Johnny's handcrafted line of health and beauty products, including Earl Gay Tea, Hint of Mint Candy, Therapeutic Bath Salts, Healing Skin Salve, Votive Candles, and a cologne, "Liminal". Shaman Johnny in the front shop and gallery. 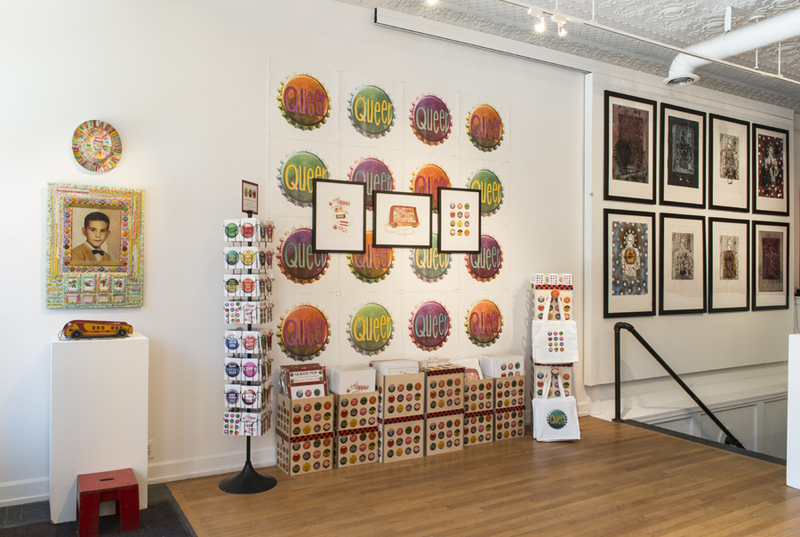 (L to R )"Self Portrait with Fruit", "Queer Gum", "gAyBC's", and "Queer Pop" with postcards, badges, mugs, and tote bags based on the "Queer Pop" print and a series of prints featuring St. Sebastian. "St. Sebastian" series and "Am I The Only Queer Here?" 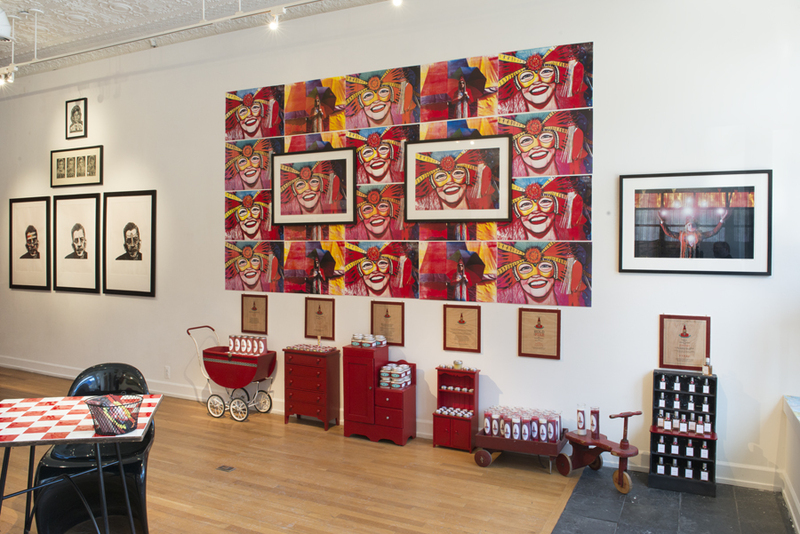 prints in front shop and gallery. Meditation area of Sacred Backroom at Shaman Johnny's Pop-Up Shop & Gallery. (L to R in back ground) "Shaman Johnny's Crown", "Throne of St. Sebastian", "Staff of Compassion", "Visual Prayers", and "Halo". "Reliquary of Protection" on table. 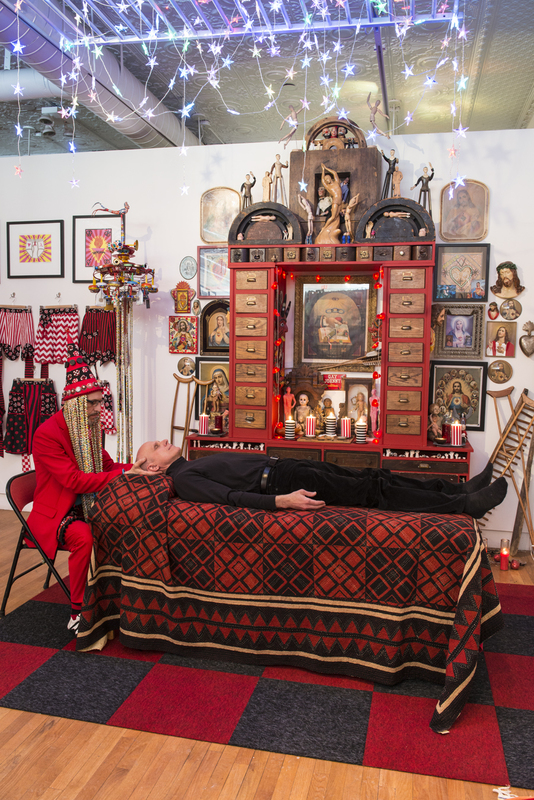 Shaman Johnny sitting with a visitor in front of the "Reliquary of Protection" in the meditation area. Divination Table in the Sacred Backroom where Shaman Johnny offered I-Ching readings. Shaman Johnny with a visitor at the Divination Table in the Sacred Backroom. "Altar of Containment and Memory", mandalas and figures, and "Table of Crowns" in the therapeutic bodywork area of the Sacred Backroom. "Altar of Containment and Memory" with bodywork table in the therapeutic bodywork area of the Sacred Backroom. Shaman Johnny laying on of hands with a visitor to the Sacred Backroom.